Type: global multimedia / multiplatform journalism project. Availability: archived project web page (text, photographs, videos) here, interactive map here, introductory video here, pdf file to download and make your own ‘The Box’ here. How a shipping container can tell the story of global trade (Source: Anon 2012a, no link). BBC News followed a shipping container for a year to tell stories of globalisation and the world economy (Source: Anon 2012a, np link). The BBC is sticking a GPS in a shipping container and sending it around the world in order to reveal the secret lives of these giant steel packets (Source: Doctorow 2008, np link). Following the voyages of a big red shipping container emblazoned with the BBC logo was an attempt to illustrate and transmit the global nature of today’s world, particularly in terms of economics (Source: Murielle 2009, np link). Their intention was to track a container all over the world for a year! and in the process demonstrate how linked we all are (Source: user742203 2008, np link). Most articles about the container shipping industry are straightforward reports of facts and figures – freight rates, trade volumes, port rankings, etc. Against the backdrop of these rather run-of-the-mill stories, renowned media channel The British Broadcasting Corporation (BBC) developed a novel project called the ‘BBC Box’, which they hoped would give their readers a fresh perspective of the industry. The BBC Box project was a resounding success .... The project was the BBC’s way of telling the more human-interest story behind the cold steel front of container shipping, and the articles – sometimes quirky, other times, serious – were received warmly by readers around the world (Source: Anon 2010a, np link). Every now and then, an idea comes along that is novel, educational, profound and entertaining. 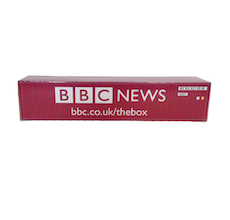 Such an idea is embodied by the BBC’s Box Project. There are so many great things about this project. First, it pays tribute to one of the unsung heroes of the modern global economy: containerized shipping. If you consume, well, nearly anything that you didn't grow or make yourself, there is about a 90% chance that that thing spent some time in a shipping container. Think about the implications of all of this. This forty foot long metal box and how it is handled influences all aspects of your life every day and has done so for almost the last forty years (Source: Shannon 2009, np link). The BBC is hopeful the container will visit every corner of the globe, and that it will not wash overboard. Its correspondents will use the container as a continuing thread to pull together a series of stories that illustrate how goods are manufactured and shipped around the world and the lives of the people involved in doing so (Source: Moran 2008, np link). The BBC has embarked on a rather odd project. They’ve fixed a GPS unit to a standard shipping container and are going to have their reporters around the world report on what went in and out of this shipping container as it moves around the world. It’s sort of like throwing a bottle in the ocean and writing about whomever picks it up (Source: Andrew 2008, np link). While there's no way to know where the Beeb's box will head next, it's easy enough to see where it is thanks to an on-board GPS unit and an ever-updated map (Source: Anon 2008a, np link). It's a brilliant journalistic conceit: everywhere the box stops to drop off or pick up a load of cargo, the BBC has a new story to tell about global business (Source: Neal 2008, np link). The Box … plans to deliver content for television, radio and online audiences - telling the individual stories behind what makes the global economy tick. (Source: Hillman 2008a, np link). The BBC Box project allowed followers to chart the container’s progress on radio, television, and online – and a year [after it began], it tells an intriguing story about the global economy, international trade, and the network of elongated, intertwined supply chains (Source: Anon 2009a, np link). What products will the box contain and how will these products connect the places that the box visits? (Source: Parkinson 2009, np link). It’s not just a hollow gesture … – the container will actually be used for carrying real cargoes, so we’ll get to watch world trade in action (Source: Raven 2008, np link). A SHIPMENT of Chivas Whisky is to become the unlikely star of television, radio and online media. The Paisley company has linked up with BBC News in a year-long project to tell the story of trade and globalisation. Chivas Brothers, the global leader in luxury Scotch whisky, will have a shipping container tracked around the world. The 12-year-old Chivas Regal will be the first cargo that will be shipped as part of The Box project, telling the individual stories behind what makes the global economy tick (Source: Hay 2008, p.8). BBC Business presenter Declan Curry will be reporting the launch from Southampton today and will relay the progress of the container as it travels the world with: Whisky from Scotland to Shanghai, China. Consumer goods from Shanghai to Treemont, Philadelphia, USA and general cargo from New York to Germany. From there the Box is likely to travel to countries like Japan, Russia, Singapore and Vietnam carrying cargoes as varied as car parts and sporting goods (Source: Anon 2008b, np link). Over the course of a year, it was filled with 15,000 bottles of scotch straight from a Scottish distillery, tape measures in China to be sold at Big Lots stores in Los Angeles, auto parts in Singapore bound for Japan, and 95,000 cans of cat food for hungry kittens in Southampton (Source: Hendrix 2011, np link). We summarise below the key highlights of the BBC box’s journey: China: The box started its journey from Edinburgh in Scotland to Shanghai in China on 22 October 2008, carrying 15,120 bottles of 12-year-old Chivas Scotch. The whisky bottles were transported to bars and pubs where middle-class Chinese hung out for drinks. The BBC correspondent in Shanghai chose to run a story on the fragile optimism in China – despite the seemingly vibrant nightlife, healthy demand for consumer goods and new store openings (Marks & Spencer opened its first store in China along Nanjing Lu, Beijing’s main shopping street, that month), imports were no longer in huge demand. Ships that sailed to Shanghai were half full, while rates headed south. United States: In Shanghai, the box was loaded with a consignment of Chinese-made plastic spray bottles and digital bathroom scales and headed for New York. Upon reaching the warehouse, the goods were transported to Big Lots stores in Pennsylvania. It was nearing Christmas in 2008 and the BBC correspondent in New York took a look at an odd gift-buying trend. Fancy a digital bathroom scale for Christmas? Apparently, cash-strapped Americans were choosing cheaper China-made items for Christmas gifts, rather than big-ticket locally-made ones. A Big Lot employee interviewed for the story said that not too long ago, nobody would have thought of giving a digital bathroom scale as a gift, but in the midst of a recession, any gift became acceptable. Brazil: A few months later, the box reached the Brazilian dock of Santos, the busiest port in South America. It carried a mix of items, including ink for pens, spearmint flavouring, additives and polyester fibre. These items would have been snapped up by consumers quickly in 2008 when the economy grew at a comfortable 5% to 6%. In 2009, however, the country was feeling the sting of the recession and imports were steadily declining. Japan: From Brazil, the box headed for Japan, stocked with food items ordered by one of Japan’s largest food manufacturing companies. Interestingly, it was not just Brazilian food items coming to Japan. Migrant workers from Brazil had also been coming to work in Japanese factories for decades. In fact, so many Brazilians were living in Hamamatsu Central that there was a radio station broadcasting songs in Portuguese. The BBC correspondent chose to focus on the plight of migrant workers for his article. The same companies that once hired these migrant workers en masse had slashed production as quickly as they could. In order to contain the fallout from these migrant workers, the Japanese government offered ¥300,000, or about S$4,700, to these workers to return to Brazil. However, the help came with a catch – they would not be allowed back into Japan to seek work on the same easy terms. Effectively, it was a one-way ticket back to poverty. Singapore: The box reached Singapore in mid-2009. Much of the region’s cargo called at Singapore’s port, but with the global recession in full swing, shipment volumes had fallen drastically. Singapore was hit especially hard, with freight rates falling to six-year lows and share prices of local shipping companies taking a beating. The BBC correspondent in Singapore spoke to the captain of the ship on which the box was loaded. The captain let in on his worries of the piracy situation along the Straits of Malacca, especially since the box had become rather famous (Source: Anon 2010a, np link). The box in numbers: Distance travelled approx 51,654 total miles. 47,076 by ship. 3,229 by train and 1,349 by road. That’s 2.08 laps of the Earth (Source: Anon 2009a, np link). The BBC Box arrived back in the UK after more than a year travelling the globe .... BBC Business editor Jeremy Hillman says the journey helped shed let on issues ranging from the growing strength of China's consumer class to international piracy and what globalisation really means close up. The last cargo, tinned cat food, has been delivered and the Box completed its journey with a visit to BBC Television Centre (Source: Anon 2013a, np link). The BBC named their project ‘The Box’ after ‘The Box: How the shipping container made the world smaller and the world economy bigger’, an interesting book on the history of containerization, and its effect on globalization, by Marc Levinson (Source: Peterson 2010, np link). Most of the world's non-bulk cargo travels in marine shipping containers - like the BBC Box. The use of containers has transformed the global cargo trade and there are now around 4,000 container ships traveling between international ports (Source: Anon 2008c, np link). Jeremy Hillman, BBC News Business and Economics Editor, said: ‘The Box will highlight major issues and trends in the global economy at a critical and testing time. It is a creative, exciting project which will provide depth to our coverage of the credit crisis and global economic uncertainty. The stories behind The Box are sure to be illuminating and fascinating’ (Source: Anon 2008d, np link). The reinforced steel boxes come in standardised sizes with standard fittings so they can be stacked on ships, trains and lorries. There are a range of sizes but container ship capacity is measured in TEUs or Twenty-foot Equivalent Units units based on the smaller 20ft [6.1m] x 8 ft [2.4 m] x 8.5 ft [2.6m] containers. The BBC Box is an FEU [Forty-foot Equivalent Unit - or two TEUs] - the most commonly-used size of container today. More specialised containers include top or side-opening containers, tank containers for liquids or refrigeration containers [also known as reefers]. Containers each have their own number, with a prefix to identify its owner. ... The containers can be stacked eight high on the decks of some container ships, and up to 11 on top of each other (Source: Anon 2008c, np link). Other than a paint job, the project isn’t costing the BBC much. Explains Jeremy Hillman … ‘Surprisingly, this project will not be costing the BBC much over and above the coverage costs for the editorial content. Whilst we have paid a little for the branding of the box and some technical costs the fact this is a working container means it will be earning its own keep. We are keeping our fingers crossed the Box does not fall overboard’ (Source: bobcouttie 2008, np link). We have painted and branded a BBC container and bolted on a GPS transmitter so you can follow its progress all year round as it criss-crosses the globe. The Box will hopefully reach the US, Asia, the Middle East, Europe and Africa and when it does BBC correspondents will be there to report on who's producing goods and who's consuming them. It is a technically challenging project and things may go wrong along the way - powering the GPS transmitter and linking that to this website has been challenging. If they do, we will tell you what is happening and work to put them right. But our hope is that by the end of the year what you will see here is a unique snapshot of world trade and how it affects the lives of millions of people. ... Lots of people have worked hard to make this idea happen and I am very grateful to the CSIS [Container Shipping Information Service], which represents the container shipping industry and has helped hugely with the planning, and also to the shipping line NYK, which is working with us to manage the project logistics. From the start of the voyage in Southampton this journey will be a real one and whilst we are controlling some aspects of the process for logistical reasons the story it tells will be a truly representative one painting a picture of what globalisation really means (Source: Hillman 2008a, np link). The Container Shipping Information Service (CSIS) is an organization formed in 2007 comprising 23 of the largest container shipping companies across the world. The CSIS was formed to give the global container shipping industry a voice with which to communicate with the world (Source: Anon 2009b, np link). The Container Shipping Information Service[‘s] … agency Porter Novelli worked with the BBC, who came up with the idea of following a single box on a year long journey around the world. … To facilitate a multi-platform story across all channels, story ideas relating to destinations were pitched. When 'The Box' was in China, the broadcaster considered the export of whisky from the UK to Asia. It has featured in a range of programmes, including BBC World, Working Lunch and World Service Radio, and newspaper articles (Source: Dunne 2010, np link). In November, Maersk Line had the honour of taking ‘The Box’ on its last journey from the UK to Cape Town, fully loaded with aid cargo. Maersk Line got involved with the project right from the start, when the BBC approached Pentalver, a Container Inland Services company, to provide the 40 foot container with its customised red livery and logo. … NYK – the BBC’s partner in ‘The Box’ project – only runs car carriers from the UK to South Africa so the Japanese carrier asked Maersk Line to step in for the box’s final voyage. ‘The BBC Box’ departed from Tilbury in mid-November aboard the Lars Maersk (Source: Anon 2009c, np link). Welcome to the BBC News photo group for The Box ... Our container has been painted in BBC colours and has a tracking device fitted so we can keep tabs on it. At each port of call BBC correspondents will be there to report on who's producing goods and who's consuming them. This [flickr] group is where you can get involved, posting your pictures of The Box as it makes its way around the world, on ships, trucks or trains, in ports or at factories, being loaded and unloaded. We’ll also be posting our own pictures from behind the scenes. The best pictures may get showcased on the BBC News website, so if you add your photos to our group, you're giving us permission to republish it royalty-free. We will attribute, and the copyright will remain with you (Source: Chris 2008, np link). [This] is either stupid or fascinating, I cannot decide which (Source: TigerHawk 2008, np link). VERY interesting... I used to see container ships during my years of working on ocean liner's and never considered the economics and strategic importance of them as an economic force (Source: HellsKitchen 2008, np link). What adventures await the BBC Box? Will it spent six weeks in a container yard in Ulan Bator? Fall off a ship, like the thousands of TEU that drop off decks every year, and circulate in the Sargasso Sea for eternity? Be discovered stuffed full of illicit Mercedes labelled ‘dry goods’ in Manila? Will it be arrested for spying on North Korea? Will it end up being looted on a beach in Devon? It’s a wild, wild world for a container out there (Source: bobcouttie 2008, np link). The thing isn't on a ship yet. It started from Southampton, and is making it's way north [by train] to pick up it's cargo in Scotland. It's now a bit west of Glasgow. I do wish more waypoints were shown on the map. There's only about 3 or 4 waypoints every day, if there were more, maybe every 30 minutes, we could track it's movement on the roads. Seeing as they said it costs them hardly anything, they should have done more than one box. Maybe 10 or 20. That will create more activity on the map. People will be less bored. If one box falls off the ship, it wouldn't kill the entire story. And they can pick which location to report on (Source: Dainel 2008, np link). The journey of the container from London to China, Japan, Singapore, Brazil, New York and Bangkok shows the penetration of shipping containers in global trade. Today, investing in shipping containers is one of the best investment schemes because the containers are always in demand in the expanding shipping industry (Source: Anon 2010b, np link). [B]eyond detailing the journalistic output and originality of the BBC project, I also want to make this ‘box’ the grist to a rather different mill … concerning the definition of the field of communication studies. The principal issues here are how we should understand the relations of communications and transport and, more particularly, how we might re-integrate the material dimension of communications into the field, which, as I indicated earlier, presently tends to be conceived of as if ‘communications’ should refer exclusively to the symbolic real of the movement of information and messages. If we begin with the question of globalization, it is worth observing, with Alan Sekula (1995), that most people talk as if globalization is all about email and air transport, and that in most conceptions of globalization, maritime space is a forgotten area (Source: Morley 2010, p.265 link). Not many people realise that because of shipping containers making transportation so much easier and cheaper, prices of all sorts of things from cars to toys, electrical equipment to clothes have been reduced. Prior to shipping containers items to be transported used to be of all different sizes and take up odd spaces on ships and require individual handling. The whole beauty of making all shipping containers the same size, or a derivative thereof, the equipment used to transport them – whether ships, lorries, cranes, trains etc can all be standardised. This makes the whole business of delivery cheaper by far and far less labour intensive. It has suddenly become more cost effective, for example, for a garage to order in cars as and when it needs them rather than keeping a whole lot in stock. This saves them a huge financial outlay in buying terms, let alone the costs of keeping the cars on site, and the price of the end product, in this case the car, to the consumer is cheaper as a result (Source: Anon 2008e, np link). To be honest, i'm not the BBC's biggest fan but this is a really interesting idea. The humble container has changed the face of world trade and i for one would be intrigued to see the scope of its travels (Source: Lester 2008, np link). Personally Biglorryblog thinks this is a terrific idea, it will be fascinating to see what the box does in a year (Source: Biglorryblog 2008, np link). Depending on whether BBC stacks the deck or not, this could also be a stunningly boring voyage, if the container simply cycles between Southampton and Bruges (Source: Zuckerman 2008, np link). Odds are that it'll wind up sitting empty in Newark, N.J. for the next two years after one trip to China like the thousands already there (Source: hallpass 2008, np link). Quite amazing and extremely fascinating to read and see the map of the container's actual journey! (Source: pakarang 2009, np link). BBC are taking there chances by telling the world that the box is now full of Whisky (Source: Mick 2008a, np link). It would get really interesting if a GPS enabled container got nabbed by pirates (Source: Arthur 2008, np link). I noticed that the positions were not posted from passing the Sudan border to clearing the Gulf of Aden. I presume this is an anti-piracy measure which we may also see in the Malacca Strait (Source: supergoods 2008, np link). The box is currently full of Scotch Whisky, and I would estimate a container's worth of that to easily be worth a good £10,000+ in value. Now could ye imagine if a criminal gang saw that on the BBCi website, decided to get a gang and an HGV together, and stop or derail the train carrying the container back south with the intention of stealing it's load, and then managed to walk away with ten grands worth of Whisky? The liability for that would go to the BBC no doubt ... And guess whose licence fees would go up to cover the costs?. .. Normally, the security of containers is in obscurity; Ye could crack-open a random container to find several million worth of Gold bullion inside (Though highly unlikely!) or just a load of scrap plastic being shipped to a recycling plant. The only register of a container's contents is normally the shipping manifest (And that's often as vague as possible) and such paperwork is always stored securely away from the container for a good reason... In the case of this one container, the BBC project removes that security through obscurity (Source: Death 2008, np link). I suspect it's being watched a fair bit and of course ship and rail have excellent load security. The same can't be said about road, have you ever considered why trucks don't travel about with 'Currys' on the side? Trucks drivers are always weary about talking about what they are carrying. You don't mention you are carrying a truck load of TVs, you certainly don't advertise it on the side. Several thousand trucks are stolen every year and there are around 80-330 hijackings. One of the worst roads is from Tilbury docks. http://www.truckpol.com/downloads/20...heftreport.pdf Most thieves use deception. Common tricks are: * Flagging the driver down pretending there is a problem with the load, the trailer or the vehicle. * Staging an accident. * Pretending to work at the delivery depot and redirecting the load, either in person or by phone. This is known as ‘round the corner’ theft. * Impersonating police or traffic officers (Source: Metroland 2008, np link). Containers have been known to be used for illicit purposes, wouldn't it be funny if the BBC's box brought in a few Kilo's of heroin or something similar (Source: Okey-Didley-Dokely 2008, np link). It would also be interesting if it went overboard from the container ship. The industry is very coy about the numbers, but it seems that roughly 2000 containers are lost annually and can take up to two months to fully sink. This is one of the most severe hazards to navigation for blue water sailors (Source: Anonymous 2008, np link). Perhaps my favourite story was that of Copenhagen Express Captain Sanjeev Kaushal who only found out about the BBC Box, and that he was carrying it on his own ship, from relatives e-mailing him on board (Source: Anon 2013a, np link). Isn't this a fascinating way to tell a dull and dreary story of the global downturn? (Source: GVK 2008, np link). Such are the trials of globalization in a period of downturn. After half a century of consistent annual growth, the volume of cargo carried by container ships decreased for the first time in May 2009. While the project was planned when global trade was booming, the story of the BBC box’s journey, marooned as it has been - for lack of demand - at various stages of its journey, has precisely mirrored the declining fortunes of the global shipping industry. If, as Roland Buerk notes in his report from Shanghai, the box is now looking a little battered, and its paint a little faded after its long journey, that would seem a fitting symbol for the state of the global economy (Source: Morley 2010, p.264 link). Its voyage has coincided with some of the most dramatic developments in the global economy including the first global recession in 60 years. And the battering our container has had along the way has been more than matched by the battering visited on the container shipping industry (Source: Hillman 2009, np link). The Box has the BBC’s name on it, but if you get the chance to look at containers in a port, you’ll see the names of innumerable companies, written in dozens of languages (Source: Love & Lattimore 2009, p.39). There is something romantic about watching giant container ships, packed with cargo as high as apartment blocks plough gracefully into port. Yesterday we watched at sunset as the Starlight entered the port of Los Angeles, America's busiest and the world's second busiest after Singapore. The BBC is interested in the Starlight, a vast Panama-registered vessel as long as two football pitches because it has been carrying the BBC Box, a red container stuffed with goods made in China across the Pacific Ocean to the coast of California. The journey from Sendai in Japan took 10 days (Source: Cerezo 2008, np link). The BBC News-branded container, The Box, is arriving in Los Angeles today from China (http://news.bbc.co.uk/1/hi/in_depth/business/2008/the_box/default.stm). The BBC is running a project tracking this container around the world - so far it has travelled from the United Kingdom to China, and is now headed for Los Angeles where it will be loaded onto a train for a final destination of the Home Depot distribution center in Allentown, PA. I have a favour to ask ... if anyone sees this container on its travels across the US, can they post a photo of it to this thread (Source: palizbay 2008a, np link). I was just wondering how one could see (photograph) the Box during it's stay in Los Angeles? I'm planning to head down to the port tonight (it's expected to arrive in LA around 8pm) ... but am pretty sure security won't let random people explore as containers are being loaded/unloaded from the ships (Source: victoriabernal 2008, np link). If it's loaded on a double stack lets hope it comes out on a daylight departure on the top level! (Source: sd90mac-h 2008, np link). Could be the [container ship] MOL Liberty, arriving from China into the Port of Los Angeles today... http://www.portarrivals.com/list.asp?sec=Port&item=16080&t=LOS%20ANGELES (Source: Lackawanna484 2008, np link). Wednesday night or early Thursday morning the BBC box (NYKU 8210506) went via highway truck, yes as in via clogged L.A. freeway mode of transportation from the Port of Long Beach to BNSF Railway's East Los Angeles Hobart intermodal yard (Vernon). BBC might have known in advance about it's arrival into the East L.A. BNSF yard. The bright but now slightly weathered red container was apparently coned off to be viewed by a private party today. A known L.A. ‘railfan’ (train spotter to you Brits) named ‘Mr. MRL’ located and posted photos of the BBC box within the BNSF train yard this afternoon. Actually, this railfan railroad employee who first found ‘Waldo’ (a newly adopted nickname for it here in the States) is a known BNSF locomotive engineer (no, not a "Train Driver"), awesome model railroader and very good photographer. He generously posted some digital images and a short blog on a popular railfan discussion website, Trainorders.com: www.trainorders.com/discussion/read.php?1,1818209 As can be read in the link, rumors have the BBC 40' container ‘box’ departing from Los Angeles on an eastbound BNSF intermodal ‘doublestck train’ at approx. 9:30a PST Friday morning. Click on the link above for details and further updates (membership is required to view the full size images) (Source: espeeboy 2008, np link). I watched a Buggy truck park the NYKU 8210506 on the east end of one of our trailer lots between Tracks 6 & 7. Believe it or not, the container is viewable from the southbound lanes on the I-710 Freeway bridge that crosses over the east end of the yard (Source: MrMRL 2008a, np link). Seems as though the tracking mechanism must have been on the ship and not the container. BBC tracking web page still shows LA Harbor location (Source: Red_over_Yellow 2008, np link). The Box, tracked a GPS-equipped shipping container .... Container tracking usually relies on radio frequency identification (RFID) tagging, not GPS technology, so this was new territory. It begs the question: are shipping containers smart objects, nodes within the internet of things? (Source: Smith 2010, np link). ... it is the point at which the system breaks down which is the most revealing - in this case about the difficulties of maintaining the effective functioning of the kind of online tracking system on which the design of the BBC project was premised. The fault proved hard to repair and for the rest of the box’s journey, the ‘mapping’ facility on the website only functioned intermittently, or at best retrospectively, which deprived the user of the (somewhat magical) sense of immediacy that had contributed greatly to the appeal of the project (Source: Morley 2010, p.264). The container has a GPS unit in it, but if there is a problem with it or it is buried deep in a ship they use the ship's tracking system. However, this container was visible on the deck of the ship so they would have used the container's GPS unit ... that is if the battery was not dead or there wasn't another problem with it. Of course, it could be the security situation that says they can't show where the container is for security reasons in case a terrorist targets it... But most likely either something wrong with the tracking unit or it just hasn't updated yet (Source: palizbay 2008b, np link). The Box is heading to Japan via the Cape of Good Hope and Singapore with a cargo of monosodium glutamate. ... the BBC haven’t given the name of the ship it’s currently on. It’s virtually impossible to get any where close to the ship to look for the container let alone to photograph it! There are new international anti terrorist rules which prohibits any/all photos being taken with in any harbor / port! This could explain why there are so few photos of the red box on the BBC NEWS web site (Source: Anon 2009d, np link). Apparently ‘The Box’ arrived yesterday at the Port of LA from Shanghai, carrying digital scales & garden supplies bound for a Big Lots distribution center in New Jersey. BBC News video of The Box arriving at the Port of LA yesterday http://news.bbc.co.uk/2/hi/business/7764789.stm (Source: MrMRL 2008b, np link). Wouldn't the BBC news crew and reporters get hungry or need air after being trapped in the container for a long period of time? (Source: missedcall 2008, np link). Well that's flawed - control of some aspects of the process for logistical reasons - the container is set free in to the system and they are giving it an advantage over what really goes on - a bit contrived ooh look there is our container placed just so for unlading / swift documentation in receiving port etc., bet they have control over what 'exciting' goods go in to it as well. It's as bad as interfering in a nature watch is that - if a container is set free in to the wild they should not interfere and 'control' any aspects (Source: FERT 2008, np link). Your right Fert it might have been better if it was just let loose in the system but maybe they want to film the goods being manufactured before they get put in the container and how the workers live where the goods are being made. And if it was just wild it might not be as interesting for the viewer to watch I think theres alot of this gos on on the telly (Source: Mick 2008b, np link). … after we passed the container It appeared that BNSF [freight rail company] officials were coning off the area and a news crew arrived. Perhaps the BBC showed up to have an interview with the local BNSF Big-wigs on how wonderful containerized shipping is for the US, and how green, fuel efficient, and environmental, yada-yada (Source: MrMRL 2008c, np link). Here's hoping the container doesn't get tagged!. Just the type of publicity we NO NOT need here in the U.S. I could just hear the BBC news anchor saying the container was neat and clean until the bloody Yanks got hold of it! (Source: rosevillebill 2008, np link). I've been following this container since it started its journey in Southampton, England a couple of months ago. I hope it doesn't end up back on a ship headed for Asia (Source: CNW534 2008, np link). Probably will do, considering where most of the US's produce comes from ... but who knows, it might head east to Europe (Source: palizbay 2008c, np link). Good ideas are worth copying. The Box ... ought to give ideas, not just to our media but also social activists groups such as Rebuild India Mission (RIM) (Source: GVK 2008, np link). The BBC … alerts us to a … fundamental point concerning the inevitable danger of generalizations - such as the common assertion that we increasingly live in a ‘culture of speed’, if not instantaneity. One striking conundrum which the study of shipping offers us is not simply that container ships still go at very slow speeds, but that, as oil prices have risen, the very latest and biggest boats have been built to go even more slowly, in order to save fuel costs. Thus, right at the heart of the process of globalization, somewhat counter-intuitively, we find some rather important things slowing down (Source: Morley 2011, p.756 link). Oh, waow... how interesting. Who could have imagined a shipping container would have traveled that extensive. Zooming out on the map and seeing it's track is ... almost incredible. Over land and across seas... And think about it for a moment, that is just ONE container! There are millions of others making the same trek around the globe while we eat, sleep and surf …! (Source: pakarang 2009, np link). Although this experiment is being run primarily to visualise how far a shipping container goes in a period of time, it could inspire businesses to track their own products and let their customers see where their items are coming from. Could a transparency of transit lead to clothing manufacturers placing shipping miles tags next to the washing instructions? Similar to how TCHO has developed its brand, the BBC is exampling how brands can embrace modern media to demonstrate a new level of transparency to consumers (Source: Reyner 2008, np link). As a lover of all things ships I’m interested but mystified as to what the BBC is trying to tell me – surely people know things mostly move by sea don’t they? Also, sadly the BBC didn’t cough up for anyone to accompany the box so we get no sense of life at sea, just a container bouncing from one place to another as they do – pretty pointless really and all fairly bloody obvious (Source: French 2008, np link). As a trade association promoting the interests and public image of Britain’s freight forwarding community, the British International Freight Association (BIFA) welcomes the BBC’s innovative project to educate the general public on issues relating to containerisation by tracking an individual 40’ container as it moves around the globe. However, Peter Quantrill, BIFA Director General, is keen that the BBC’s project demonstrates the full complexity of the modern supply chain in which BIFA members, the freight forwarders who fill many of the containers, play such an important role … ‘I can see why modern container shipping, with its massive ships, double-stack trains, 24-hour operations and sky scraping gantry cranes will appeal to broadcasters and viewers. But BBC should not ignore the less photogenic services that forwarders provide behind the scenes. The decisions taken by BIFA members directly affect container shipping and activity. They work as facilitators for their clients to get their commodities from factory to customer. Without forwarders, many of the containers would have nothing in them to move!’ BIFA also suggests that the project needs to explain how the consequences of containerisation have spread far beyond the physical handling of goods to altering the very nature of consumerism and shipping. Quantrill said: ‘The focus on one individual container, which after all might be lost if it is swept overboard at any time in its year-long odyssey, might lead to the bigger picture being missed. Can one container really demonstrate how retailers and distributors use the supply chain to keep inventory? Does it say anything about how many products have been turned into commodities where the pressure is always on to stock shelves in a timely manner to prevent rivals' products being chosen?’ (Source: Anon 2009e, np link). So, the next time you are driving down the highway (or stopped at a railroad crossing) and rusty metal boxes are whizzing past you, think of how they influence your life and how you live it on a daily basis. The most profound notions often emerge from the simplest of things. I think this is a great example of just that (Source: Shannon 2009, np link). I got quite a shock this morning when on BBC Breakfast they announced that they were going to be following the progress of a 40ft shipping container as it journeyed around the world! Not something I was expecting – and I am afraid that in my shock I spilt the milk going into my cornflakes – but what a great idea! (Source: Anon 2008e, np link). The BBC was looking to generate five or six key stories through the project, says Ian Aitchison, General manager of Group Communications for NYK Group Europe, which has been project managing the exercise. ‘They certainly achieved that – at one point, every time they put something on the main news, the BBC Box website was getting up to one million hits. The BBC has been amazed by how this has taken off’, he says (Source: Anon 2009f, p.25 link). Surprisingly perhaps, the BBC were not prepared for the interest shown by teachers and students in the project, and quickly produced additional resources for those who want to follow the box. Here are some more suggested student activities for engaging with the project (Source: Parkinson 2009, np link). We were surprised, pleasantly surprised at the scale of it. Fairly early on it was obvious that it was being picked up by a lot of blogs and forums - both specialist transport ones but also more general ones where people were sort of saying ‘Hey, have you seen what the BBC’s doing? What a great idea.’ Then we started getting pictures sent in ... So we reacted to that by setting up a flickr group - that’s the photo sharing website flickr - where people could post their own pictures, but where we also intended to post the best of the pictures that readers had sent into us. A tribute group was set up on facebook [called ‘I’m following the BBC box’, which took us aback and pretty quickly got more than a hundred members and is still growing. Then it even grew beyond that. We had some sort of enthusiast, um, apparently some sort of hipping enthusiast set up a dedicated website called followthecontainer.com where he fed off what we were doing but added his extra content to it, his own videos, videos he found on YouTube around containerisation. In a way a classic example of a great story being picked up and the audience imagination feeding into it and producing content elsewhere and developing the story into a much bigger phenomenon that we thought it would be (Source: Hamilton 2008, np link). When I saw the BBC start this project with the container on the webpage, I thought ‘Here’s a wonderful opportunity to get involved’ and I thought it would be so easy to create a model of the box that I could offer to the BBC, they could put on the website, people could download it and make their own version of the box (Source: Hathaway 2008, np link). For those modellers among you, go to http://news.bbc.co.uk/1/hi/in_depth/business/2008/the_box/default.stm and on the right hand side you will see a link to a PDF containing a template for this container (in the 'Project Update' section), which you can photocopy to whatever scale you model in, cut out, and fold up to create your very own model of this container. I have it in N scale - haven't popped it onto any of my trains yet, but might give it a go this weekend ... just for the hell of it :-) (Source: palizbay 2008d, np link). You can … print off a PDF to create your own shipping container model. That’s my model to the left. Notice the fine handiwork and craftsmanship. I expect to ship approximately 40 sticks of gum across the office by the end of next week (Source: Anon 2009g, np link). We've had a lot of interest in the technical details of how we're tracking the container and doing the mapping. There's also been a huge amount of interest from schools and teachers and we're now working with the BBC School Report project to see what we can do there (Source: Hillman 2008b, np link). What’s really heartened me is that school, and geography teachers, and all sorts of audiences have latched onto this as a way to understand what’s going on in the global economy (Source: Hillman 2008c, np link). Schoolchildren have been following the Box’s progress in their classrooms, learning about globalization through its journey (Source: Murielle 2009, np link). I know a lot of school kids are following this container. I think it's a great way to learn geography. Makes me want to go back to school (Source: Applegate 2008, np link). The Container Shipping Information Service (CSIS) is launching a new set of resources designed for use in schools. Its aim is to provide teachers with the tools and information to introduce discussions on global trade and container shipping into the classroom. Among the new resources is an interactive animated video which allows users to follow the journey of certain products from source to store with quizzes and information pit-stops along the way. Also available are a ready-made container shipping presentation covering everything from history to interesting facts and figures, and a pack of information about the crucial Panama Canal. All of this builds on the knowledge available on the CSIS website, www.shipsandboxes.com, and encourages the next generation to think about the way our goods are transported and how we benefit from the container shipping industry. You can view the new CSIS resources at www.shipsandboxes.com/[TBC] The launch of the education resources is a first for CSIS and comes hot on the heels of a BBC initiative aimed at boosting awareness of global sea trade (Source: Anon 2008f, np link). In the end, one could say that the box told exactly the opposite story to that which had been anticipated when the project was planned. Having been designed as an exemplary pedagogical tool to demonstrate the vibrancy of global trade, what it ended up demonstrating was how foolish were the presumptions that such trade would continue untroubled into the future. Faced with a crisis of oversupply of capacity consequent upon the optimistic shipbuilding orders that had already been placed before the economic crisis broke, the joke was now on the container shipping industry. However, in another sense, the project was a resounding success. Not only did it function literally, as a vehicle for its material contents, but also metaphorically, as a kind of ‘object lesson’ which provided a very effective ‘vehicle’ for a variety of localised stories about the state of international trade in all the places through which it is passed. Thus, while performing its practical function as part of the transmodal transport delivery system, in the material realm, at the same time, in its virtual dimension, it simultaneously allowed the BBC to deliver a rich seam of multiplatform content to their various television, radio and online audiences (Source: Morley 2009, np link). The project's lofty aims - to uncover what makes the global economy tick - have, in a remarkable twist of fate, come to fruition. What began as a visionary media stunt to demonstrate the complexity of global trade has ended on the rusty steel-strewn shores of India. After it became lost some time in the second-half of 2008, the BBC Box suffered a short career as contraband mule before it was abandoned and sold for scrap by an unidentified Macau-based party, reports say (Source: Skinner 2009, np link). [T]he box sat vacant for several weeks after suffering from effects from the global recession. The company that transported the box, NYK, lost $350 million dollars and 8,000 jobs (Source: Caroline 2009, np link). [The BBC’s] project partners NYK have generously agreed to donate the container for charitable use and they will transport it to Africa where it will be refitted as a permanent soup kitchen for some of those people who have been worst affected by the global recession. And for all the Box aficionados, our website will remain active so all the content we have produced can continue to be enjoyed in the future. This box not only brings the world to your living room - it has changed the world (Source: Hillman 2009, np link). At first sight no one would think there would be a connection between the British Broadcasting Corporation, the City of London and the small community of Kleinvlei at Eerste Rivier on the Cape Flats. But at a ceremony at the RR Franks Primary school in Kleinvlei all three came together in the final part of a story which began more than eighteen months earlier in the United Kingdom. On March 25th 2010, the BBC handed over the container to an African charity, ‘Breadline Africa’, for transformation into a community kitchen. The newly renovated container, which will serve as a community kitchen for the people of Kleinvlei, was officially opened by the Lady Mayoress of London, Mrs. Claire Anstee, who is in Cape Town on an official visit to South Africa with her husband the Lord Mayor. During a colourful ceremony at the school, which included the singing of the national anthems of South Africa and the United Kingdom by the school choir, and dances by various groups, thanks were expressed to the BBC, to NYK shipping lines which donated the container, to Maersk shipping lines which transported it to Cape Town for free, to “Breadline Africa”, and to the Principal of the RR Franks school for agreeing to host the container in their grounds. “Breadline Africa” has renovated more than 100 containers to serve as kitchens, classrooms, libraries and clinics over the last 15 years (Source: Anon 2010c, p.9 link). The Box is now a fully equipped soup kitchen that serves the poor of Kleinvlei in the semi-rural community of Eerste Rivier (First River) outside Cape Town. The container that once sailed the ocean waves has come to rest in a tiny part of the Western Cape that experiences great hardship. In its new form as a community kitchen for the hungry, the Box will provide for the most basic of human needs by nourishing children and the elderly. We think it’s the Box’s greatest adventure yet! (Source: Anon 2013b, np link). According to Tim Smith of Breadline Africa: ‘The Children’s World Kitchen project has benefited enormously when they received this container. It is three years since this container was received and began serving the need of the community.’ (Source: Anon 2013c, np link). Anon (2009c) The BBC Box embarks on last voyage. maerskline.com 14 December (http://www.maerskline.com/print/?node=2166286&page=news&path=/news/story_page/09/BBC&lang=en last accessed 4 July 2013). Anon (2009f) BBC Box project is right on. North News 11 (http://www.northpublications.com/north_news/north_news_11/index.html#/25/zoomed last accessed 4 July 2013). Page compiled by Tommy Sadler, as part of a followthethings.com internship, edited by Ian Cook. Ship Legoing by Diana Shifrina, Eeeva Kemppainen, Jack Parkin, Sabrina Skau, Eleanor Bird & Ian Cook, spotting by Ian Cook (last updated July 2013). Box-making and photography by Ian Cook using this DIY kit.